Sophomore net-minder Cameron Gornet was a surprise starter in Monday's Beanpot consolation game against BC, making his first career start. 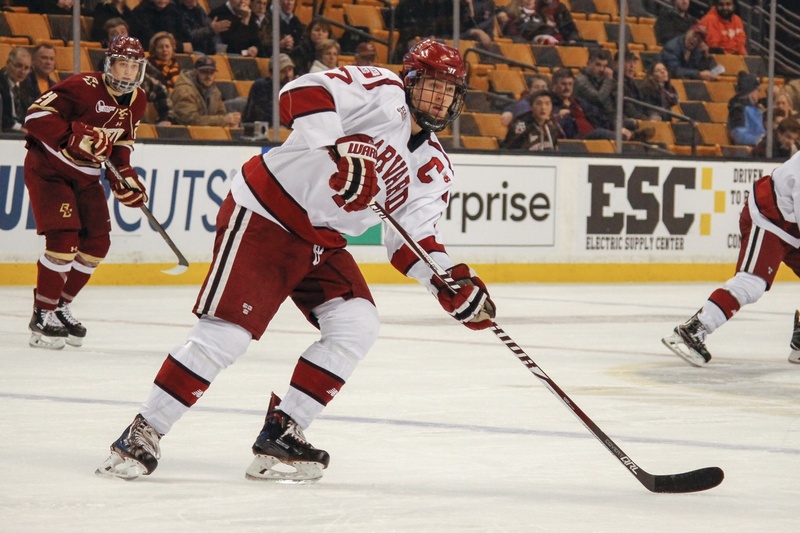 BOSTON — Neither the Harvard men’s hockey team nor Boston College wanted to be there. But on Monday night, both squads faced off in the Beanpot consolation game after falling to their respective semifinal foes one week ago. For the Crimson (11-10-4, 9-6-3 ECAC), the battle for third place did not carry any urgent implications, as a conference playoff title is currently the golden ticket for an at-large bid to the NCAA Tournament. 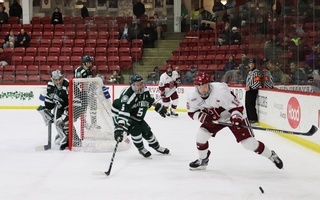 This being the case, the contest was primarily about getting back on track for a Harvard team that had slipped in four of its past five games entering Monday’s tilt. In some ways, righting the ship is exactly what coach Donato’s group did. The Crimson’s power play experienced a major resuscitation, and the squad is back in the win column after a 5-4 overtime triumph over the Eagles (14-13-3, 14-6-0 Hockey East). In others, the team has yet to iron out certain aspects of its season. The goaltender situation is even more complicated than it was prior to the Beanpot, and ultimately, third place in the Boston hockey classic is a disappointing downgrade from last year’s tournament crown. 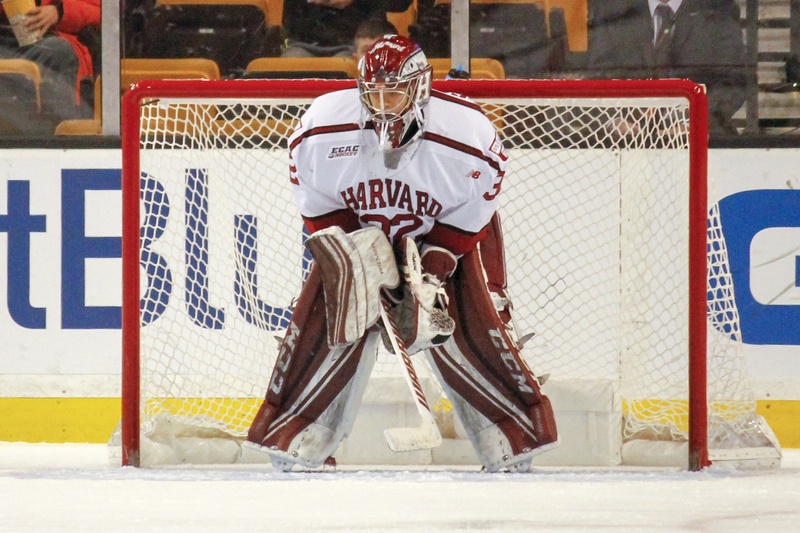 This season, something of a position battle has emerged between Harvard’s pipes. Tri-captain Merrick Madsen, the usual starter, entered the campaign as the obvious go-to after logging a program-record 28 wins in 2016-2017. But junior backup Michael Lackey has earned seven starts this season, and his play has made coach Donato more comfortable yanking Madsen on the senior’s off-nights. On Monday evening, a new layer was added to this goaltender controversy, as sophomore Cameron Gornet was given his first career start amid the uncertain situation in the blue paint. Madsen (7-7-3, 2.20 GAA, .922 SV%) seemed to have earned back the starting role before allowing a savable goal in double overtime last Monday in the Beanpot semifinals. So, Lackey (3-3-1, 2.63 GAA, .906 SV%) started in Friday’s game at Union but ceded three goals in the Crimson’s defeat to the Dutchmen. For the first 57 minutes of action on Monday, Gornet looked solid for a backstop making his first ever start. The St. Louis, Mo., native had only allowed two goals, putting Harvard, up 4-2 at the time, in prime position to put the Eagles to bed. Then, Gornet and the rest of the Crimson let up, surrendering a pair of tallies in less than a minute. The goals not only reinvigorated BC but also marred Gornet’s numbers, as the sophomore finished with a pedestrian 3.83 goals against and .882 save percentage in 63 minutes of action. 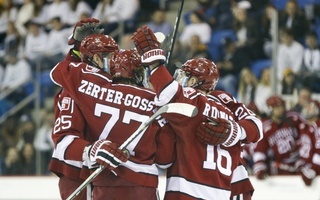 It remains unclear whom coach Donato will trust with the bulk of the puck-fielding duties down the stretch. Perhaps some stability in net is just what Harvard needs to keep its season rolling during key scorer Ryan Donato’s Olympic absence. Monday night, the Crimson snapped a five-game power play drought on junior forward Lewis Zerter-Gossage’s first-period goal. Until the tally in-close on sophomore goaltender Ryan Edquist, the squad had not found twine on the man-advantage since Jan. 20’s 4-3 OT victory over St. Lawrence. This streak marked Harvard’s longest such dry spell since the 2014-2015 season, when coach Donato’s group went six games without a man-up goal. This season’s stretch accounted for even more fruitless attempts (17) than the deficiency at this time of the year in 2015 (14). Tri-captain Eddie Ellis, who assisted on rookie Jack Donato's goal midway through the third period, was among the team's senior leaders who identified a Beanpot title defense as a season goal. Sadly for him, it wasn't in the cards this year. Despite the disparity in attempts between these two power play skids, losing was a common theme. In 2015, the Crimson dropped four out of the six games included in its drought. Similarly, Harvard’s 1-4-0 record since the St. Lawrence game has slowed any momentum the team had generated in the early part of 2018. With the power play being an integral part of the Crimson’s—and any team’s—game plan, it is no surprise that Harvard’s performance suffered while its man-up unit struggled. From Dec. 30 to the start of these troubles, the team enjoyed a stretch of unbeaten play thanks to a 3.50 goals against average, good for 11th in the country over that span. Since then, prior to Monday’s tilt, the Crimson had potted the puck just 1.40 times per game, which was dead last in the NCAA. 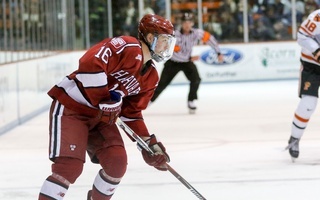 Harvard’s growing power play troubles were only underscored by Donato’s hiatus for the Olympics, which began last Wednesday. As the squad’s offensive centerpiece, the Scituate, Mass., native has played a key role on special teams this season. Prior to his departure, Donato sat tied for first on his team with eight power play points and, perched in his left-circle office, always demanded attention from the penalty killers. Even without the junior forward there to grease the wheels, the extra-man unit got the job done against the Eagles and even added another score in the third frame when freshman forward Henry Bowlby punched a puck through Edquist’s five-hole. In short, the Crimson finally took care of the elephant in the room—or rather, on the ice—in Monday’s Beanpot consolation game. Much to coach Donato’s dismay, Harvard will have to hand over the Beanpot trophy to Northeastern this year after winning the tournament crown—as well as bragging rights throughout the city—in 2017. The Crimson leadership set out this season with multiple milestones in mind, an ECAC points threshold and NCAA Tournament aspirations likely among them. The first objective the team could have checked off that list was bringing home a second straight Beanpot for the first time in program history. Regardless of tonight’s specific result, the Crimson icemen would have left TD Garden with a dissatisfied demeanor. Harvard waited 24 years between its two most recent Beanpot titles, as Boston University and BC dominated the event. Another such drought in the tournament would bother the Crimson even more now that many of the program’s current players have experienced victory. The Eagles will likewise strive to reunite with the Beanpot trophy as soon as possible. BC’s last-place finish marks the second time in tournament history and first time since the 1974 and 1975 events that the Eagles have placed fourth in consecutive years.